Rodger Thomas loves old relics. He loves antiques, artifacts, anything rusted or aged. "Artifacts seem to speak to me when I see them, " says Rodger. He envisions the abandoned object's reincarnation as a light fixture and relishes the chance to get his hands on them...or in the above case, his hands on mannequin hands. Rodger hopes his pieces convey an appreciation for our collective past. They certainly make you feel in awe of what he has accomplished. 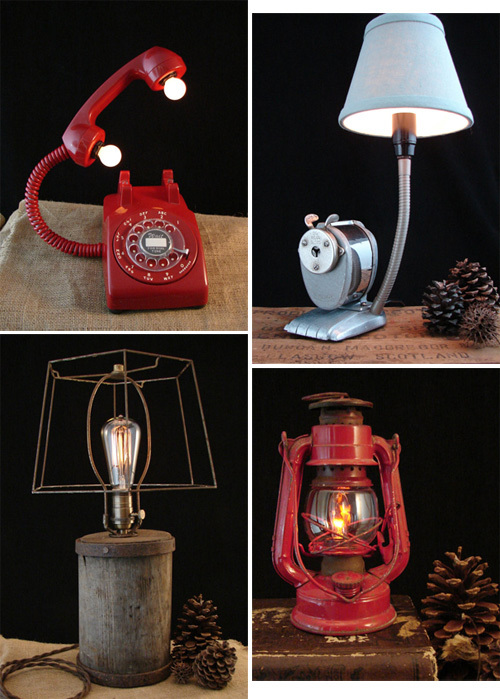 He can bring light to just about anything, including an old school rotary phone, a vintage pencil sharpener, a Japanese made 'Winged Wheel' kerosene lantern, or a used and abused wooden hub found inside a Texas barn. Rodger is his biggest fan of this steam shovel lamp. As he shared, "As a child, my favorite Tonka trucks were the rusty ones. I would find them discarded in the woods and those would be my favorite 'play in the dirt' trucks." So when he found this rusty toy, he knew immediately that he wanted the cab to be lit with a radio bulb. He added, "I was compelled to do it." Rodger sources his materials from all over the South, explaining, "I go to antique malls, junk shops, thrift stores, barns, sheds, estate sales, junk piles, old dump sites..." Sounds like he could have his own tv show. When I asked Rodger what type of decor his pieces worked well with, he replied, "Shabby chic, eclectic, man cave, dorm room, coffee house, industrial." It seems like every manly space could benefit from one of his charming, conversation pieces. 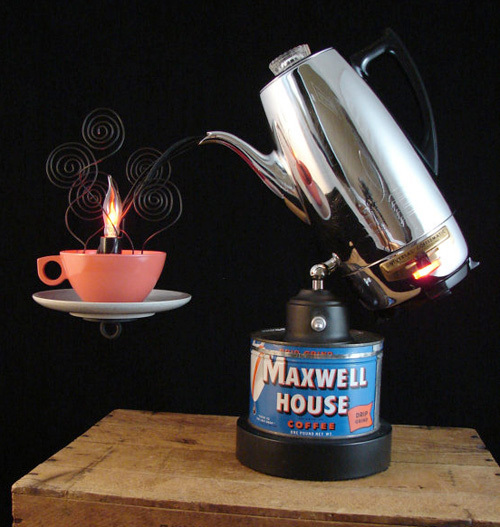 This light fixture is especially fun, inspired by a Maxwell House tin from the 1930's. This piece is steeped in nostalgia. Looking at this old relic, Rodger recalls, "fishing trips with my dad, mowing lawns for the neighbors, 4th of July, cutting down trees for firewood, being forced to work in the garden all day..." It's an old JC Higgins Picnic Jug that Rodger fixed up and illuminated for your home decor pleasure. As Rodger suggests, "It's perfect for a summer home, cabin or mountain retreat." I like how Rodger is updating his pieces for the modern home, adding outlets for the all too important cell phone or your favorite tech gadget. 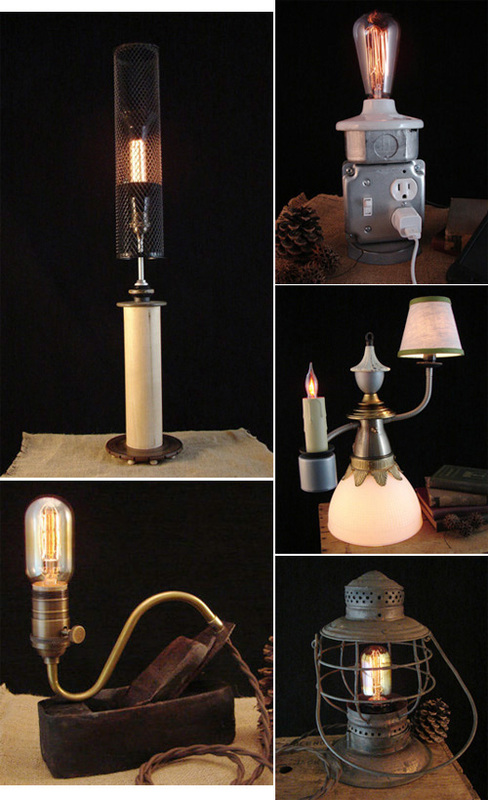 Click to learn more about the coffee cup lamp or the upcycled desk lamp. I especially like his pendant lights that utilize vintage farm pulleys. You'll notice that Rodger uses the Edison filament bulbs in many of his fixtures, which really complements the old time look and feel of each piece.